Mount Mayon is blessed with an almost-symmetrical conical shape, which has caused people to call the active volcano the “perfect cone”. Its rare symmetry attracts numerous tourists (both local and foreign) and has made Mayon Volcano one the best-known landmarks of the province of Albay. During your visit, make sure to take a picture of its cone and admire its raw beauty. Mayon Volcano has an elevation of 2,462 meters above sea level, making it a favorite among mountain climbers. Its rugged and varied terrain — which features forests, grasslands, and rocky deserts — provides a challenge to climbers of all levels and puts their skills to test. If you love mountain climbing, you might want to see if you can set aside a couple of days to ascend Mount Mayon. The Cagsawa Ruins have become synonymous with Mayon Volcano; in fact, you’ll often see these two attractions together in pictures and postcards, with the ruins in the forefront and Mount Mayon in the background. The Cagsawa Ruins are some of the most popular attractions in Bicol and is even recognized by the International Tourism Course as one of the must-visit places in Asia. The ruins were created when Mayon Volcano erupted in 1814. The eruption caused lahar and tephra to flow through the town of Cagsawa and bury it, including the Cagsawa Church. Today, only the belfry and some parts of the original structure can be seen, forming the iconic landmark. When you visit the ruins, check out the Cagsawa National Museum and take a look at its displays of geological and archeological artifacts as well as photographs of the eruptions of Mayon Volcano. You can also go on all-terrain vehicle tours and explore the lava trails in the area. If you watch the U.S. reality TV show Survivor, you probably already know that two of the show’s seasons were filmed in Caramoan, Camarines Sur. 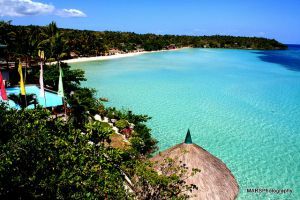 You may also already know that the area has breathtaking natural beauty, complete with attractive beaches, clear waters, and interesting flora and fauna. Well, now’s your chance to personally see and experience what this beautiful town has to offer! During your trip to Bicol, take the time to drop by Caramoan and check out its many wonderful attractions. 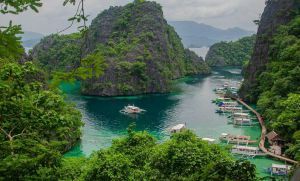 One of the places you should explopre is the Caramoan National Park, which is not just a home to several bird species that are endemic to the Philippines but is also a favorite of many migratory birds. During your visit, you’ll have the chance to see a wide range of feathered animals including pigeons, hornbills, and mallards and even magnificent birds of prey like hawks and eagles. Of course, the Caramoan Natural Park isn’t just about bird watching since you can go spelunking in it, too. Check out Omang Cave, which is located inside the park, and enjoy its eye-catching stalactite formations. You can also visit other caves in the area like Culapnitan, Manipis, and Bulang Bulang. These are just some of the top attractions that can be found in the Bicol region. Explore these interesting sights and have the ultimate Bicolandia adventure!